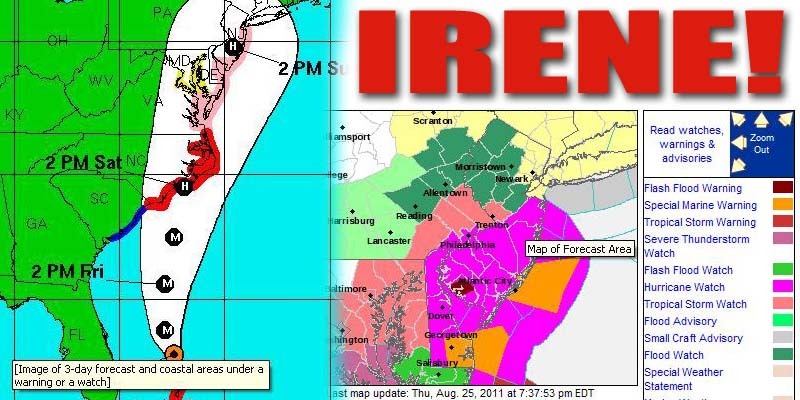 August 25, 2011 - Irene! This looks like the real deal - south and east of the HUB especially! Something of which we have not seen in this area of the world in many years! Be safe out there! 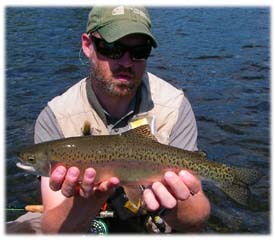 The decent fishing continues to chug along on the West Branch of Delaware. I mean daytime rising fish in August to mayflies - what more can you say. Again as has been the pattern all summer long the dirty sulphur continues to do the trick. And if that does not get a look see from below try a tan caddis. The fish just can't seem to resist either of these patterns. Subsurface try a small flashback pheasant tail as a dropper. We continue to see decent size fish coming to hand, but we are also seeing an exorbitant amount of smaller fish - both bows and browns in the 8-12" range. Fat mid-summer day brown caught on a tan caddis. 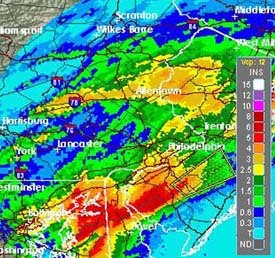 It's been a long time since we've had a rainfall like today. Just a good 'ole fashion soaking with no serious flooding. Let's hope this has broken the back of the Mother Nature's heat and we can now look forward to cooler nights and more comfortable fishing weather for both us and the fish. If nothing else, days like today make for good bench time. Now is the time to replenish the box with the fall season go-to patterns. With multiple trips slated to the Upper D over the coming weeks, Isos are the fly of choice being cranked out from the vice. On our Patterns Page we have posted our money Iso pattern. Blind fishing this in the riffs has for, as long as I can remember, been an effective fish catching method for us. Or toss a rig of an Iso dry and some sort of dropper. 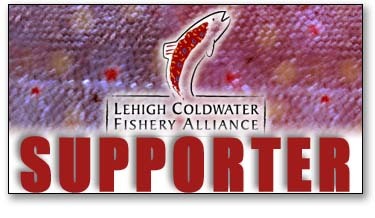 This is a great method to prospect for fish! August 1, 2011 - Shallow Water Slashers! The consistent drum-beat of solid fishing continues to steam along on the West Branch of the Delaware despite record setting July heat here in PA! 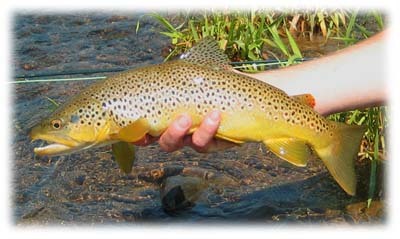 As has been the case recently the fish are being found in your typical big trout habitat locations as well as in the skinny water. It is amazing how shallow some of these larger trout are being found. Both rainbows and bows in less than a foot of choppy water. Obviously these fish are dialed in to this consistent flow pattern we've been seeing since June 1 and are feeling very comfortable nosing into the food-rich skinny water. Lets just say - - happy fish, equal happy fisherman. And there is no shortage of both this summer! Mid-day when you might not see anything happening, just blind fishing the shallows with a high-floating dry will surely get some looks. Small parachute sulphurs (16-18) and larger isos (10) have been producing as well as tan x-caddis patterns in size 14-16. Talk about fun fishing in the middle of the day. If looking to search a bit lower in the water column rig up a dropper of a caddis worm or a small flashback pheasant tail. 5x tippet and long leaders are a must - upwards of 14-16'.